Looks like amohl we knew that in times of crisis we can band together, put our differences aside, petty or stark as they may be, and fight for the common cause. Why is the name Schneerson missing from the signatures? u say: in times of crisis we can band together. can we now expect chabad to join the next giyus protest? 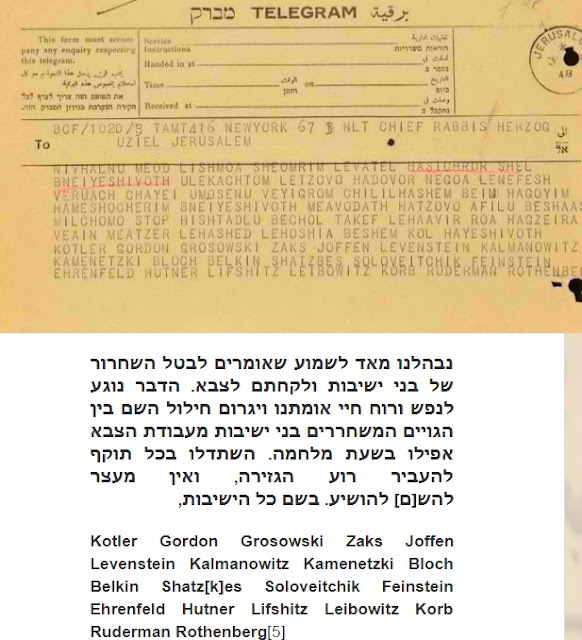 I assume you are commenting on the lack of Teitelbaums, Halbershtams, Twerskys, Schneersons, and Hagers on this telegram. Where were they? Did they not care? I assume Lebowitz is Rav henoch Lwbowitz from Choftz Chaim. does Bochner's still use 1950s cash registers? either one is healthier than Ritalin etc. pushed on minors by "licensed adults" excessively. Amool we addressed our gedolim with a Reb-a-reb 'וכו a minimum of decorum was expected even from the alienated, would you call the behsh't to by his surname? Can you please post a picture of the actual text of the telegram? Where did you find this? Any idea the story behind it? in the heading you could of click on the button Source: "Seforim Blog" But I'm sure it's easier to ask others, sure go ahead..
Korb is Rav Chaim Yitzchak Korb, RY in HTC Chicago. A picture of the actual text of the telegram is posted. There's a link to the source on top - from the Seforim blog, found in the archives of Chief Rabbi Herzog, to whom this telegram was addressed.